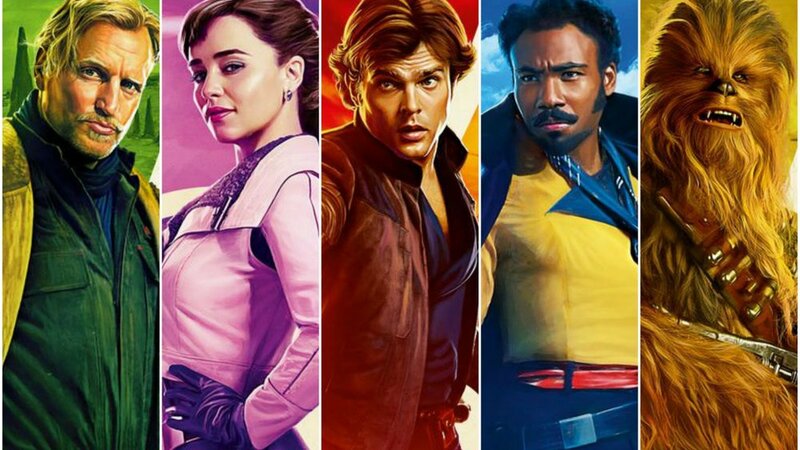 My initial expectations for Solo a Star Wars Story were quite low, after hearing about the troubled production and not being the most exciting things in the world. Then the early reviews started rolling in and they were mostly positive though there were a few saying that it was generic. So going in I expected at least a well-made movie with my biggest fears being that this would just be a by the book and uninspired. Turns out the movie is pretty good, its very solid for the most part but by the end does leave you wanting. The comparison I would give would be Pirates of the Caribbean: Dead Man's Chest aka the second one. I thought Dead Man's chest was a solid movie again not the best but for anyone who has seen the movie it definitely leaves you wanting. The gist of the story is that we follow Han initially on his home planet of Corellia, from a small stint in the imperial army to getting involved in the more shady side of the galaxy. The movie takes influence from heist movies, westerns and adventure movies such as Indiana Jones and it's at its best during the riffing on these other genres. However this is a bit of a mish mash nature through the film likely owing to its troubled development even though most of it was shot by Ron Howard. By the end it starts to become more of a Star Wars movie and it does start to lose a bit of its luster and like I said prior, it leaves you wanting. The movie is best when its doing its contained and doing its own thing not troubled the fate of the galaxy, going solo if you will. When it comes to the performances they're pretty decent for the most part, Alden Ehrenreich as Han Solo is pretty good, he is definitely no Harrison Ford but brings the spirit of the character. Woody Harrelson is Tobias Beckett, he's Hans Mentor and he wants to put together a team so you know what happens to him. Thandie Newton plays Val, Beckets wife so you probably know what happens to her. Also pretty sure she was added in re-shoots. Qi'ra is played by Emelia Clark a pseudo love interest for Han and ends up being a bit of a femme fatal/bod girl-esque character. Emelia Clarks acting is a lot better than it is in that Terminator movie but could be better also the chemistry isn't really there with Han/Alden. We Donald Glover as Lando Calrissian who does an amazing Billy Dee Williams impression which is good but that’s kind of it an impression. He still cool and charismatic as Don Glover normally is it does get a bit weird especially since it highlights how strangely Lando speaks. Paul Bettany is the villain which is pretty cool, it’s a bit hard to get past human Jarvis/Vision being the bad guy it works fine enough here. L3 is a robot character who to me mostly felt like another K2SO which the shtick that she's a "Feminist" Robot which was a bit strange and potentially mean spirited given some of the things that are in the movie. Overall I found the movie to be pretty decent, its probably the best it can be given the circumstances. A lot Han's origin is covered to the point where maybe too many of the mundane details from the original trilogy are explained. The movie is definitely at its best when its doing its own thing but collapses bit due to some inconsistencies and likely issues relating to its development. Like I mentioned before this movie felt a lot like Pirates of the Caribbean Dead Man's Chest, pretty good, hits the right notes for the most part but it leaves you wanting.